This artwork is divided into two halves. 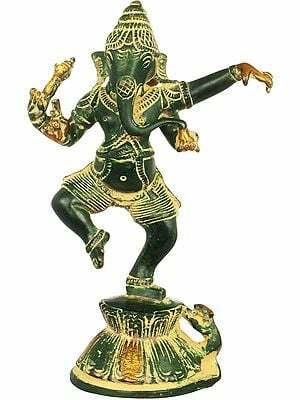 The upper half shows Ganesha in a sophisticated dance movement. Ganesha's mount, the mouse is shown paying obesiance to him. Ganesha is usually depicted either as a pictograph or as an idol with the body of a man and the head of an elephant. His unique feature, besides the elephant head, is the large belly practically falling over his lower garment. On his chest, across his left shoulder, is his sacred thread, in the form of a snake. The vehicle of Ganesha is the mouse, seen here paying obeisance to his lord. According to the strict rules of Hindu iconography, Ganesha figures with only two hands are taboo. 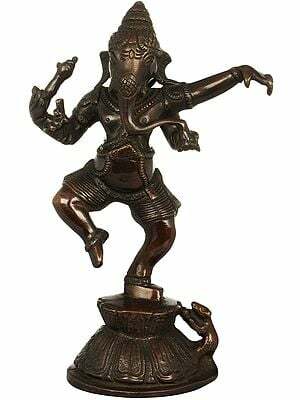 Hence, Ganesha figures are most commonly seen with four hands which signify their divinity. The bottom half of the painting is inhabited by the image of Lord Vishnu, the Preserver in Hindu mythology. He is being paid obesiance by Garuda, his mount. The painter first chooses two pieces (generally tussar silk) of cloth and he sticks the pieces together by means of a paste prepared from tamarind seeds. They are then dried in the sun. The tamarind paste is traditionally prepared as follows: The tamarind seeds are first kept in water for two to three days. When the seeds swell and become soft, these are ground with a pestle stone till the formation of a jelly like substance. In an earthen pot some water is poured along with this substance which is finally heated into a paste. The pieces of cloth thus pasted into one become a Patti.The Patti may be of an area of a few square meters. After the Patti is dried it is rolled up and from this roll, pieces of pata are cut and utilised for individual paintings. The colors are hand prepared by the artists from natural ingredients like china-clay, soft clay(chalk), conch shell, red stone etc. The black color is prepared from charcoal powder. For white, the artists use sea shells which are available in plenty on the sea shores of Orissa, the home of pata paintings. The sea-shells are powdered and the powder is kept mixed with some water for two days.The mixture is stirred properly until it becomes soft and milky. This milky liquid is then heated with the gum of Kaitha fruit (Feromia Elephantum). The paste thus prepared is then dried in the sun to form a solid substance.